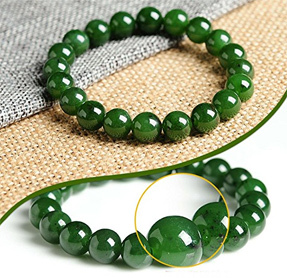 Because Coral is of organic origin, its most important function is to connect us with Nature and Her blessings. The tender energy of Coral is the main thing that draws us to this stone over and over again. Coral teaches us of the principles of giving and receiving. It improves our tact, intuition, imagination, and visualization, and helps in acquiring knowledge of the higher worlds. Coral is actually not a mineral. It is comprised of the skeletal remains secreted by marine coral polyps. These tiny animals live in colonies that branch and grow in size and can be major integral parts of the vast coral reefs and coral islands – atolls. Corals grow as branching structures, very similar to a tree. The composition of most Corals, be it red, pink, orange, white, or blue, is primarily calcium carbonate. The black, brown, and golden Coral, however, are made out of a keratin-like organic substance. Orange colored Coral is the most common and is also very popular for making jewelry. Coral reefs are located at the eastern coast of Australia, in Japan, around the Canary Islands, and in the tropical oceans close to the equator. The deep red color in Corals is the most valuable and has been used for jewelry production for ages. Rough Corals have no distinct shine, but after polishing, they can take on a high shine. The polish will last for some time, gradually declining as Corals are very sensitive to heat and acidic environment. Once erroneously believed to be plants, Corals were given the description “sea gardens”. The ancient Egyptians used Coral as a protective stone to guard their burial tombs against evil spirits. They believed that each piece of red Coral contained a drop of Divine blood. According to Greek mythology, after Perseus cut off Medusa’s head, the drops of blood spread across the sea, and thus Coral was created. Pueblo Indians used Coral to denote one of the basic life elements. Hopi and Zuni Indians believed that the “way of life” can be manifested with help of the four elements: Coral, Jet, Abalone2, and Turquoise. Coral soothes the emotional body and brings peace. 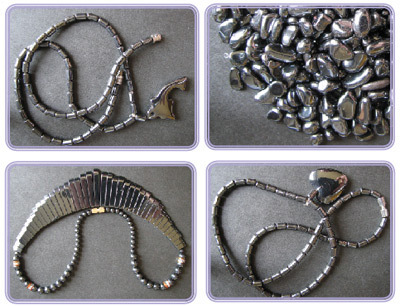 It improves intuition and imagination and enhances the functions of the brain. Coral will help you understand and better apply what you have learned in your mystical experiences. It also helps fight depression and disappointment. It is a symbol of joy and happiness and conveys a sense of pleasure and delight in life. All types of Corals can raise the energy levels of the body. They are capable of opening and activating the root chakra. In healing, Coral may be used to regulate the blood circulation and to regenerate the body tissue on cellular level. Coral helps treat the nervous system, digestive tract, and spine problems. The best way to discharge and simultaneously charge your Coral is to put it into sea water, or, alternatively, salt water. If you need to charge your Coral jewelry, use dry sea salt. The hardness of coral is not great. It is on the bottom end of the spectrum of hardness of minerals. In Vedic astrology, Red Coral is connected to planet Mars. Even though Coral is not a birthstone in the traditional or modern birthstone chart, it can be associated with the Zodiac signs of Libra (in some traditional interpretations), as well as with Pisces, Capricorn, Scorpio, and Taurus. If you find yourself attract to Coral, especially Red Coral, and you are born in one of the above signs, consider wearing this stone. It can be especially beneficial if used on the root chakra. According to Vedic Astrology, Red Coral may also benefit the Aries Zodiac sign and wearing coral jewelry can be useful throughout their entire life. To people born in this sign, it is believed to instill personal power, physical and mental strength, and longevity. Red Coral provides energy and a sensation of warmth to all those who are in need of the fire element. 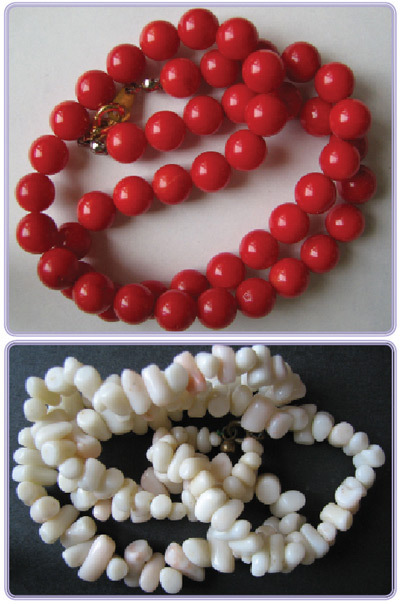 Red Coral offers protection to pregnant women and their unborn children. It also protects against infections, blood related issues, and black magic. White Coral is beneficial in case of bone diseases, rickets, and periodontitis. Pink Coral soothes sore joints and bones. It cleanses the physical body from toxins. Black Coral helps in case of cancer and abscess. If one feels repulsion at the mere sight of black Coral, it can be an indication of a possible disturbances in the organism. 2 Abalone, one of the most colorful stones, is actually a type of sea shell. It often displays the rainbow spectrum of colors. In part based on the Book “The Magical World of Crystals” by Olga Rezo.